860 DSPi (Discontinued) | VIAVI Solutions Inc.
Portable cable analyzer and CATV meter with a built-in DOCSIS 3.0 modem for performing transmission and signal quality tests for analog and digital HSD and VoIP services. The high-performance portable analyzer for the digital age. The 860 DSPi is a cable analyzer and CATV meter that performs transmission and signal quality tests for analog and digital HSD and VoIP services. Fast and powerful, Trilithic's popular 860 DSPi offers a versatile solution for your changing business needs. Evolutionary platform lets techs change with the times - without changing meters. Thanks to DSP technology, you can update or upgrade your 860 DSPi with a simple Internet download - anytime or anywhere. Your techs can change with the times - or with new services - without changing meters, which can change your bottom line. No other meter gives you lower lifetime costs. The 860 DSPi can be easily upgraded for new applications – right in the field – or add powerful options like high-resolution spectrum analysis, QAM and QPSK constellation displays and a wide range of return path tests, all without impacting size or weight. This option builds in a CableLabs® certified DOCSIS 3.0 modem, enabling a full complement of DOCSIS 3.0 tests. The Wi-Fi option builds in a Wi-Fi (802.11 b/g) adapter, enabling a full complement of Wi-Fi network verification tests. Enables troubleshooting ingress and impulse noise within an active upstream channel band. This is one means for verifying the upstream transmission capability of a particular segment of the network for higher order QAM signals, up to 64 QAM. Many cable systems have stepped from QPSK to 16 QAM and now are moving to 64 QAM for upstream data transmission. This optional feature allows the operator to connect an off air antenna to the 860 DSP input port and read level, MER, BER, and view constellation and equalizer tap information on 8 VSB channels. This option allows the technician to test upstream/downstream data path throughput to the full range of the bonded channels. This is a valuable tool for verifying provisioning as well as bandwidth availability at customer homes or at key test points in the system. Provides periodic grants for an upstream service flow without the need for a cable modem to transmit bandwidth requests. Enables in-service testing when used with a 3rd party Line Blanker. This is feature that can be used to verify the line blanking. Measures Amplitude, MER/BER, EVM, Equalizer settings. With option displays Constellations. Test all digital parameters affecting HSD performance. Includes Ping and Throughput tests. One-button test sequence for Lost/Discarded Packets, Latency, Jitter. Automatically calculates MOS. Tests to the CMTS, Tests to a target Server. Displays Ingress spectrum from Headend, compares with local ingress, displays return Tilt and Gain (with option). Performs automated installation testing of Upstream Transmit Levels and C/I, from sub to Headend (with Option). With the VITS option, headend technicians can view Vertical Interval Test Signals (VITS), which are inserted during the vertical synchronization interval of analog video, and specify lines for testing. The option enables the technician to measure differential phase, differential gain, chroma delay. Note: Technicians who do not maintain DOCSIS services and/or do not need a modem-equipped field analyzer may want to choose the 860 DSP analyzer. The I-Stop is a 1 GHz reverse test probe that is used with signal level meters for bi-directional measurements with no risk of power damage to the meter. Just screw the probe into a distribution tap's unused KS port and a spring-loaded "stinger" connects a 20 dB resistive test point circuit to the hardline. The bi-directional connection lets a meter or analyzer measure forward and reverse signals, as well as reverse ingress. A built-in AC/DC blocking circuit protects the meter or analyzer from damage from online power up to 90 volts. The I-Stop also works with both the Original and New DSP Family of Field Analyzers and the 9581 SST to let you track reverse ingress sources down to the nearest tap without removing reverse modules or diplexers and without disrupting forward or reverse service. Precision RF coaxial test cable (3 foot) with 75 Ohm impedance and F-Type Male to Male connectors. Strand hook for use with the Original and New DSP Meter Families. RS-232 serial data cable for the 860 DSP & DSPi with DB-9 (male) to 3.5 mm TRS mini jack. Vehicle power adapter for the 860 DSP & 860 DSPi. AC to DC power adapter & battery charger for Trilithic Products. 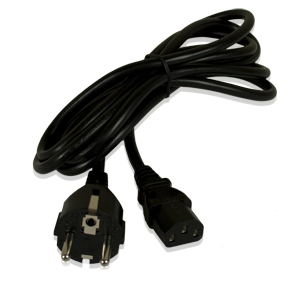 This is an AC to DC power supply with a 6 Foot US power cable with a 3-prong grounded plug Male (NEMA 5-15P) to 3-pin shroud plug Female (IEC 320C13). Can be used to replace the AC to DC adapter & battery charger that is included with the following products: 8300 FST (8 MHz Euro DOCSIS), 860 DSP, 860 DSPh with Euro Power Supply, 860 DSPi and 860 DSPr with Euro Power Supply. Shoulder strap for use with the Original and New DSP Meter Families. Ni-MH battery for the 860 DSP & 860 DSPi Field Analyzers. Internal Ni-MH battery for the 860 DSPi. Includes cable modem power connection. Requires a hardware change at factory, call for RMA 317-895-3600. Set of five (5) clear plastic adhesive shields used to protect the display of the 860 DSP & 860 DSPi. Replacement input F-connectors for the Original and New DSP Family of field analyzers. Threaded Female to Female F-connector. MINIMUM QUANTITY OF PURCHASE IS 25 PIECES.